The saltwater aquarium hobby has seen huge blooms after the release of Disney’s “Finding Nemo” in 2003 and again with “Finding Dory” in 2016. Many movie-goers want to take a real live Nemo or Dory home for their own aquarium but don’t realize what that actually involves. So, what do you need to take your favorite animated fish home without becoming a Darla? © 2016 Disney/Pixar. All Rights Reserved. © 2003 Disney/Pixar. All Rights Reserved. 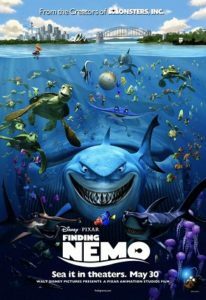 The fish and other sea creatures featured in these movies are, first and foremost, saltwater animals. That means they need a saltwater aquarium. This isn’t as easy as putting some table salt in your home aquarium. The water has to be mixed to the correct levels (Specific Gravity 1.020-1.024) in a separate container before being added to the aquarium. Most of these creatures are also tropical, which means the tank needs a heater to maintain warm water temperatures (75-80 degrees F). The décor of saltwater tanks is usually different than freshwater as well; unfortunately, ornaments like Mount Wannahockaloogie just don’t work very well in saltwater aquariums. Most saltwater aquariums use natural crushed coral substrates and live rock although non-animated decorative ornaments are usually safe. For more information of basic aquarium care, visit our Saltwater Aquarium Basics Guide. So what about the fish and other animals? Some of the movies’ characters are obviously impossible and even illegal to keep in home aquariums. Others are very difficult while some are very common and easy for hobbyists to care for. We are only going to discuss those characters here that are within the scope of our hobby. The Hippo Tang is a fairly delicate fish with a weak immune system. They also grow too large for many aquariums. Although tempting, only experienced aquarists with larger, established aquariums should attempt this fish. 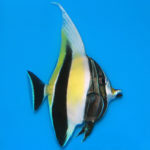 Like other tangs, Hippo Tang can become very territorial and only one should be kept per tank. For more information on keeping Hippo Tangs, visit our Tangs & Surgeonfish Care Guide. We could debate about exactly which kind of clownfish are featured in these movies, but they are probably Ocellaris Clownfish. Percula Clownfish are also very similar in care and appearance (they just develop thicker black margins). Clownfish like these are some of the easiest saltwater fish to keep and can be kept in much smaller aquariums than many of their costars. Captive-bred fish are much hardier and better for the environement than their wild counterparts. Their anemone home is much more delicate however and has some much more intensive requirements. 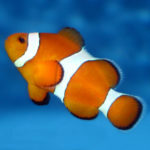 Most clownfish – especially captive-bred – don’t need an anemone to be happy and healthy. 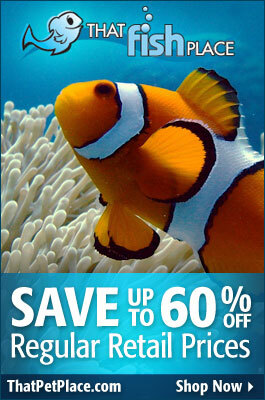 For more information on keeping Clownfish, visit our Clownfish Care Guide and Clownfish and Anemone Preference Guide. Octopus are very specialized and difficult to care for and need a specially built aquarium to keep them from escaping like Hank so often does in “Finding Dory”. They will also eat almost any tankmates they are kept with. 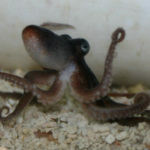 Only expert aquarists should attempt an octopus. Although not as delicate now as they were even when “Finding Nemo” was first released, Moorish Idols are still difficult to maintain for long. 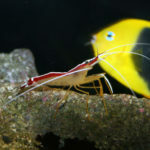 It is difficult to keep these fish healthy through collection and it can be tricky to get them to eat in home aquariums. It is best to stick with hardier lookalikes like the Longfin Bannerfish (Heniochus sp.) for new or novice aquarists. Although these puffers are usually only a few inches in length when they are sold for aquariums, they can grow to almost 2 feet long! Puffers also have very strong beak-like teeth and can crush through shells. Unfortunately, most of his tankmates in Dr. Sherman’s office wouldn’t have survived being kept with a puffer. 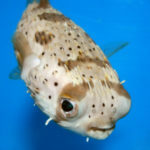 Puffers “blow up” as a stress reaction and, while comical to us, this is very stressful and even dangerous to the puffer and should NEVER be provoked for any pufferfish. It is difficult to tell exactly what kind of starfish Peach is but most of the thick-bodied starfish like her are fairly easy. 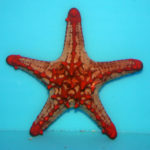 However, most of these also eat snails and other inverts so use caution when choosing your starfish and its tankmates. They are sensitive to water quality and changes in water quality so make sure the tank stays clean and stable. Royal Grammas are colorful fish found in the Caribbean and western Atlantic Ocean, unlike the Pacific homes of most of the other fish in the movies. They are hardy and easy to keep, but can be territorial. Only keep one basslet in the aquarium unless it is very large with lots of rockwork. 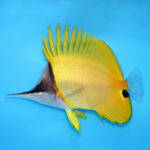 Yellow Tangs like Bubbles were some of the first to be kept by home aquarists and are still some of the most popular. 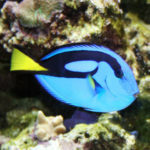 They are hardier than tangs like the “Dory” Hippo Tang but are also more aggressive. Once they establish a territory, they will not tolerate other tangs – or possibly even any other fish – entering it. 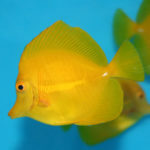 Only keep in a large tank without any other closely-related tangs or closely-colored fish. Damsels like Deb are some of the hardiest and easiest saltwater fish to keep. They are usually recommended as the first fish for any saltwater hobbyists to attempt. Most damsels can get very territorial however so make sure the tank isn’t overcrowded and there is plenty of territory for these fish. The 4-stripe Damsel specifically is one of the milder-tempered of all damselfish. Like Jacques, shrimp like these will clean parasites and dead scales off of other fish, but they will also eat almost any other food they are given. They are some of the easiest shrimp to keep but, like the starfish, need stable and pristine water quality. Shrimp molt their shell to grow so it is common to find an empty shell every now and then. Don’t keep with predatory fish (like pufferfish, for example) as shrimp are often easy prey. 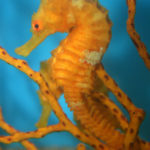 Seahorses are easy now than years ago and captive-bred seahorses are becoming more and more available. They are still very delicate though and keeping them with any other tankmates is difficult. 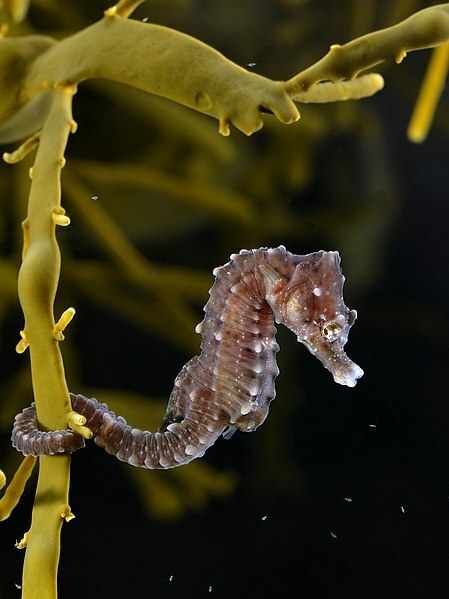 It is best to keep them in a seahorse-only tank and by advanced aquarists only. Because of their very thin “beaks”, it can be difficult to get these fish to eat in home aquariums. They need small food items at least once or twice a day. They may also eat some corals as well as the tubed feet from starfish and sea urchins. These characters are just a few of the sea creatures that Disney’s revolutionary “Finding Nemo” and “Finding Dory” franchises have brought to the forefront of the both the aquarium hobby and pop culture, but they are the most suitable for aquarium life. If you choose to bring any of these movie stars into your home, choose carefully so you can give them the best home possible. Remember, as Bruce and his crew have taught us, “Fish are friends”! 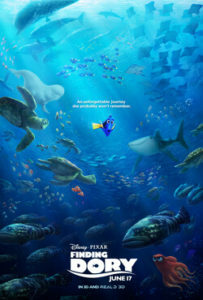 © “Finding Nemo”, “Finding Dory” and all the characters within are created by and property of The Walt Disney Company. Hey there! This week I wanted to talk about something a little different than my usual cichlid blog. I wanted to share some tips on how you can develop spectacular color on tropical fish in a way you may have never considered. A few years ago, we moved into a house that had a small pond in the front yard. It was one of those rigid, preformed round ponds about 15 inches deep with a 50 to 80 gallon capacity. We kept a few goldfish in there the first year. They grew and made it through the winter just fine as we expected. The following Spring, I got hold of some Astatotilapia aneocolor from Lake Victoria, 2 males 3 females to be exact. I was told by the previous keeper that they were aggressive, so I put them in a 55 gallon. I figured that would be plenty of space, since they were only 2.5 inch fish, and that they would leave each other alone for the time being. Boy, was I wrong. One of the males showed his dominance within 2 hours of being added to the tank, and no matter what I did he couldn’t be swayed. I moved decorations around, gave him a time out for a week in a net breeder, and I even put him into an aquarium with four 3 inch Black Belt Cichlids hoping he would be intimidated into submission. He went nuts in that tank, too, and started beating up the Black Belts, so back into the original tank he went. He quickly went back to his old ways, dominating and terrorizing the other male. He finally ripped out male no. 2’s right eye. I wasn’t sure what I could do for him. Then it occurred to me that I did have another place for him to go. The temps were high enough outside, so why not? I decided to relocate One Eye to the pond outside to give him a chance to recover. I watched to make sure that the other fish (goldfish) didn’t bother him and they didn’t. In fact, by the end of the week ol’ One Eye was the sole proprietor of the pond. For the next few weeks, he ate well and still came up to the surface to see who was around the pond when I went to feed. I only had a little internal filter system on the pond, and soon the water started turning green. Before long I could barely see One Eye to see his condition, but i knew he was still alive and growing, possibly even larger than the bully inside. He was eating well, besides my offerings he ate insects that fell into the pond, and I also noticed he was scraping algae off the sides. Meanwhile the dominant male in the 55 was attaining his astounding breeding colors. He was red on top half of his body and yellow on the bottom half with black fins. The nights started to get into the mid 60’s, so it was time to bring in ol’ One Eye. When I netted him out I was shocked to see that he was an inch and a half larger than my dominant male and his colors were unbelievable! He had a deep maroon upper half and the bottom half was gold…I kid you not. I mean it was so vibrant that I couldn’t help but wonder what would happen to other fish from my collection if they had the same conditions. The following Spring, I upgraded the filter setup to an internal mag drive pump pushing into a Fluval 403 canister filter with the return line feeding a waterfall. I started keeping Albino Eureka Red Peacocks outside in that pond after the upgrade. You can see the results in my photo (top photo, sorry it’s a little blurry). There is no match for the magic of natural sunlight and the varied diet tropicals can get outside. A friend of mine kept Red Terrors outside, where they bred for him through the season. Summer vacation outside isn’t just for cichlids, it can also be done with platies, swordtails, guppies and pretty much anything tropical if you have a place for them. Even small patio ponds could be populated with livebearers or tetras. Imagine a school of Cardinal Tetras soaking up those sun rays! Any pond will do as long as it doesn’t get too hot or too cold, and as long the fish have a little cover to protect them from would be predators like herons. While the benefits are great, there are also some cautions to consider. This time I’d like to talk about some of the dangers and pests that may wreak havoc on our poor little fishies. I was lucky not to have my pond visited by pests, but local stray cats, opossums, raccoons, snakes or predatory birds that may decide to visit your pond at any time. Even bugs like dragonfly nymphs can prey on young and small fish. Ample water movement and surface ripples are usually enough to deter them, but more effort may be needed to deter larger predators. There are some easy ways that you can help to protect your fish while they enjoy their outdoor summer vacation. Personally, I would recommend the live plants. You can use floating foliage like water lilies, duck weed or hyacinths for cover and protection for your fish. Young fish will also hide in the roots and feed on the small bugs that live in the roots. Another solution is the use of pond netting. The netting can prevent many predators from snatching your fish out of the water. Not very aesthetic, but effective. Pesticides and other contaminants may pose a hazard in an outdoor environment. Toxins can be washed into a pond during heavy downpours or may be blown into the water. The rish is small as long as you stay aware when applying such products…something to keep in mind. Even the rain itself can be a danger to your fish. Acidic rain can drive your ph to low levels if you have a low kh. Depending on the species you’re keeping, such fluctuations can wipe fish out quickly. I was able to keep the kh high and the ph stable with weekly buffered water changes so thi swas never a problem in my experiences. Cool temps are the other concern. It’s important to know when to bring them in. For me, when night temperatures start dipping below 75 F, I know it’s time to bring them back to the tank. You may notice the fish becoming lethargic, and some may even die if you don’t pay close attention at the end of summer. I recommend acclimating them slowly back to indoor temperatures. If the filter running the pond is a canister filter, I would recommend keeping it running on the main tank. Clean it out before bringing it inside, but you’ll be supplying an established filter/biological for your indoor tank, and you don’t have to wait for the whole cycling process. We drain the pond each year and look for babies. You can then either store it till the following year or couple of set it back up in the house for the winter. I hope this inspires someone else to try some tropicals outside. You wont regret it. Let me know if you have any questions, I’ll be happy to help you out. GloFish are some of the most popular, colorful and controversial fish to enter the aquarium trade in a long time. 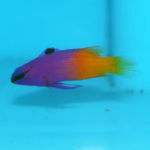 Their easy care, small size, peaceful nature and neon bright colors make them appealing to aquarists of all ages, but the modifications that cause these bright colors cause some debate among aquarists, scientists and environmentalists alike. The original “GloFish” were not created for the aquarium trade. They came from a popular fish used in many different fields of research, the Zebra Danio (Danio rerio). 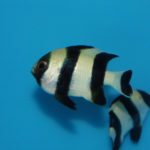 Zebra Danios have been used in research for environmental studies, cancer research, genetics, reproductive biology, neuroscience and applications to other fields as well. They even made the trip to space in 1975 on the Russian “Salyut 5” space station. So what makes them such good research subject? Zebra Danios are easy to breed and it only takes hours for the internal organs to develop after the eggs have been fertilized (about 24-36 hours, depending on temperatures and conditions). During this time, it is easy for researchers to monitor the development of the embryo since the “shell” around the eggs is a clear membrane. The eggs can hatch about 12-36 hours after that (again, depending on the conditions). These variable time frames also mean that, while the development is being studied, conditions can be adjusted to slow down or speed up the development, depending on what exactly the researchers are trying to determine. The genetic sequence involving the structure of the Zebra Danio’s DNA and RNA is very well-known at this point and is comparable enough to our own that, by understanding how changes in this structure affect the fish, researchers are gaining more understanding into how changes in our genetic structure can affect our own health. In habits, appearance, and evolutionary history, the African Butterfly Fish, Pantodon buchholzi, is one of the most unusual of all aquarium species. Yet despite having been in the trade for over 100 years, this “freshwater flying fish” (a misnomer, see below) gets little attention. Captive breeding is challenging but possible, and its fantastic hunting behaviors are thrilling to observe. I helped to set up an African Butterfly Fish exhibit at the Bronx Zoo, and was not at all surprised when it became a great favorite. Most of the visitors I spoke with were astonished to learn that such an “exotic” creature, worthy of a large zoo exhibit, was available at many pet stores! The yellowish-green to silvery-tan body is marked with an intricate pattern of speckles and lines. The huge pectoral fins, reminiscent of those of marine flying fishes, lend an uncanny resemblance to a dead, floating leaf when viewed from above. Long rays extending from the tail and the pelvic fin add to its remarkable camouflage. The African Butterfly Fish’s mouth is noticeably upturned, an adaptation for feeding on insects at and above the water’s surface. Less noticeable is the mouth’s large size and the many teeth it bears; although it tops out at 5 ½ inches, this specialized predator can take quite sizable insects and fishes. Hello, Frank Indiviglio here. In 2001, I wrote a book about the Natural History and Care of Seahorses. As I intended, many readers were discouraged, due to the demands involved in their care and the fragile state of wild populations. Today, I am happy to report that captive-born individuals of several species are regularly available, and that the task of feeding them (a major stumbling block) has been greatly simplified. Still, they are not ideal for every aquarist. Following are some important points to consider before you decide to keep these intriguing but challenging fishes.